High Efficiency: The 36-100 fractional distillation apparatus has up to 200 theoretical plates at atmospheric pressure. Distillation columns can be stacked for even higher efficiencies. They are well suited for producing high quality fractions and making difficult separations on samples from 30 to 1000 ml. 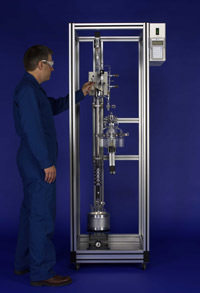 Low Column Hold Up: B/R 36-100 fractional distillation apparatus has a low column hold up. After the distillation is complete, less than 1 ml will be left behind in the distillation column. Low column hold up is always desirable. But it is especially important when the sample is very small to begin with.